Our work in behaviour change started 10 years ago, as a social movement that inspired people to use their everyday actions to affect social change, launched by David Robinson in east London. As We Are What We Do, we aimed to make this movement and these actions as widely relevant and appealing as possible by designing simple, bite sized behaviours, using a non-judgemental tone of voice and maintaining a quality of design that matched that of mainstream advertising. 10 years on and the ambition to drive mass behaviour change remains at the heart of our work, but we’ve gradually adapted our approach to become a very different kind of organisation. These changes have been driven by an obsession with evaluating the impact of our work, learning from new research in behavioural sciences and emulating the best practices in social innovation across the commercial and social sectors. As a result, we’ve moved from communications to product design and from project delivery to venture incubation. 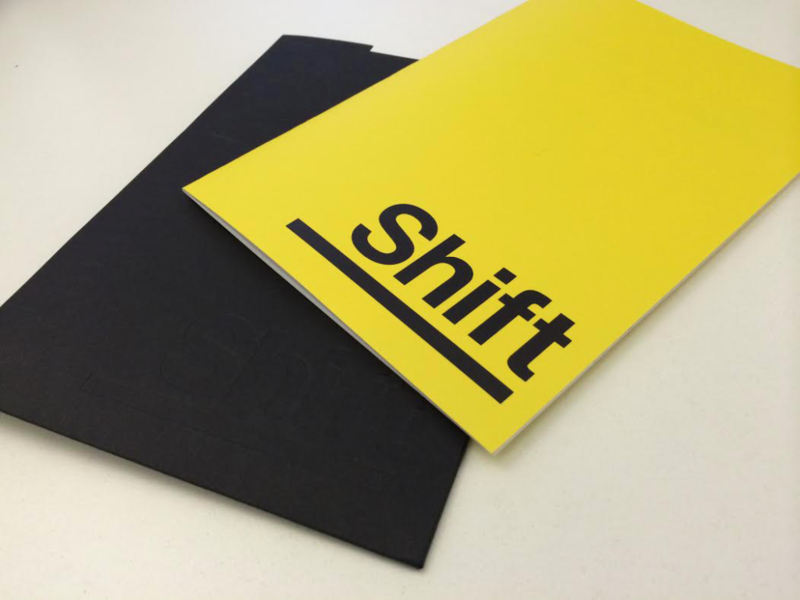 Our new brand identity, Shift, is designed to reflect this. We’ve developed this new approach, in part, from a better understanding of how and why we all make decisions. We have learnt that, despite what can be achieved with a more engaging style of communications, as shown by our first little book Change the World for a Fiver, there are huge limitations to what any communications can deliver in terms of behaviour change. First, at the point of engagement, behaviour change communications often miss huge swathes of the target audience – particularly those that are most affected by (or most affect) these issues. It is very common, as a result, for interventions like public health campaigns to actually increase health inequalities as they consistently fail to engage the most vulnerable audiences. Secondly, even when people do engage with and remember these messages, there is a often a substantial discrepancy between the intentions they establish and the new behaviours they drive. For example, a study by Pennsylvania State University found that, of a sample that had been through an education programme on the importance of eating fruit and vegetables and intended to eat the recommended amount, only 6% actually did so. Finally, we know that even when good intentions do translate into new behaviours, we all have a mental offsetting system that can drive a rebound effect. A Taiwanese study, for example, showed that when people took vitamin supplements (or thought they had) they were more likely to indulge in unhealthy behaviours – as if they felt their healthy duty was done. The same rebound effect has been identified in relation to civic and environmental behaviours. We try to overcome these multiple limitations by creating consumer products that immediately facilitate behaviours. The daily use of a product, whether its a mobile app or a breakfast cereal, delivers a daily behaviour, directly and predictably. By designing and marketing products based on the strong intrinsic motivations of the target audiences – aiming to respond to needs and wants and generate strong demand – we can engage key audiences and drive measurable outcomes more consistently. The more recent changes to our approach have also come from a better understanding of how the marketplace of consumer products functions. Again and again, when we investigate new product categories and understand their effect on behaviours, the same pattern emerges and the same need for disruptive innovation can be identified, not just for different products but different kinds of businesses. In our work on youth obesity and fast food, it quickly became clear that purely commercial products and services tend to act in certain ways: they provide an increasing array of healthy options in higher income areas, while condemning lower income areas to almost exclusively unhealthy options. In Forest Gate in Newham, where we’ve been working for some time, there are 30 fast food take-aways in one small area, 25 of which are deep fried chicken. Businesses focussed on profit maximisation generate solutions which provide positive options for some and highly negative options for others. The hole that this leaves is highly consequential for the health and wellbeing of millions of people. Our work on mental health demonstrates the same pattern. The scale of the problem is unequivocal, with 1 in 4 of us suffering from a mental health problem over our lifetime and estimated costs of over £100 million a year in health care costs and lost productivity. The evidence for effective preventative solutions is also unequivocal. Cognitive behavioural therapy, mindfulness meditation and yoga have all been proven to reduce the incidence of mental illness. Commercial product design has, in recent years, developed hundreds of products and services that contain and market these benefits, but they aren’t relevant or accessible to the audiences that will benefit the most from preventative solutions. Evidence clearly shows that living in poverty brings with it poorer mental health and adverse mental health outcomes are 2 to 2.5 times higher among those experiencing greatest social disadvantage compared to those experiencing least disadvantage. Similarly, common mental health disorders start before the age of just 14 in 50% of cases – and 75% before 24. These audiences, however, are the least likely to access the commercial self-help products with proven preventative effects from which they would benefit the most. Our early work on debt and financial planning demonstrates this pattern even more clearly. While the market can provide high value customers with financial planning services, ensuring the most efficient management of their finances, it surrounds low income customers with high cost credit products that push more and more families into vicious cycles of debt. The barriers to entry into this market are high, but the need for disruptive innovation and sustainable, competitive social ventures is urgent. So, we set out to not only design effective, desirable products but also to establish and incubate new social ventures that can thrive in these challenging marketplaces. The development of business models that allow these ventures to attract significant investment, sustain themselves and grow, while delivering measurable social impact amongst the audiences that will benefit the most, is the hardest but most important part of our work. We assess the progress of this design process by building and measuring three strands of value – social value, user value and financial value – an approach that we have developed with the Nominet Trust. There are many challenges contained in Shift’s ambitions, but over the last few years the number and impact of organisations working alongside us has grown and the possibilities to affect real change are becoming more and more real. That includes other teams working to design effective products and services, such as Significance Labs, FutureGov and the Behavioural Insight Team, as well as social investors and thought leaders, such as the Nominet Trust, Nesta, Google, the RSA and the Design Council. We work with and learn from these organisations and many others as we take forward several strands of product design and venture incubation, including our biofeedback video game to improve mental wellbeing amongst young people, our healthy fast food network improving availability in low income communities and Historypin, which aims to increase social capital in local areas and decrease social isolation of older people. We hope that, as Shift, we can continue to contribute new ideas and approaches and, most importantly, measurable, long-term impact on some of society’s biggest social challenges. By Nick | October 13, 2014 This entry was posted in Design Thinking. Bookmark the permalink. While I appreciate the need for the organisation to move on, your old site “we are what we do’ was a wonderful teaching tool for social change/action and I was wondering if there was a way to access a cached copy so it could still be shown as an example of social action? This site is no longer moderated so is filling up with spam unfortunately.